Bitcoin’s popularity has increased exponentially over the past year, as cryptocurrency continues to go mainstream. However, not everyone is excited and optimistic about Bitcoin. Several governments have stepped in recently, as Bitcoin’s popularity and market cap have impacted fiat currency valuations. Feeling threatened with a lack of understanding of cryptocurrencies, some countries have gone as far as to put out-right bans on Bitcoin trading. With all the recent sweep of government regulations, we wanted to develop a visual that highlights the legality of Bitcoin by country. In our visual, we wanted to highlight the globe and where each country stands on Bitcoin. 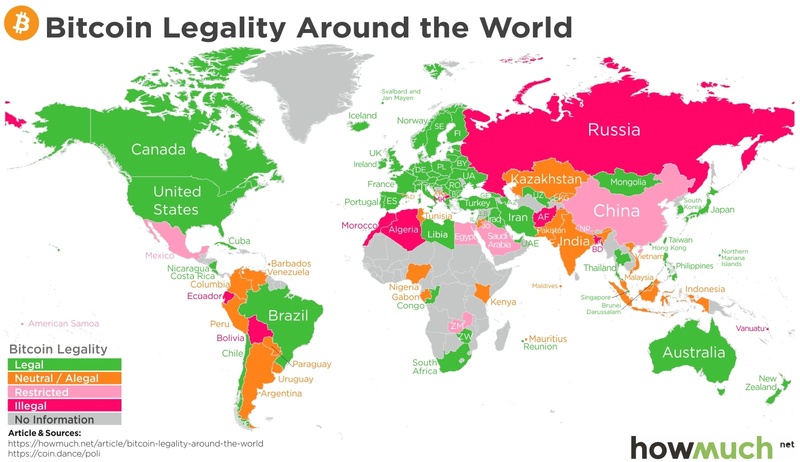 Using a color legend, we created a range of Bitcoin legality that helps show the varying degrees of acceptance around the world. Green countries are legal Bitcoin markets. Orange represents neutral markets that are not outright legalizing Bitcoin, but do not have any major restrictions against the use of cryptocurrency. Light pink countries are restricted Bitcoin markets that may have lots of red-tape, regulations, and government attempts to slow the use of cryptocurrencies. Dark pink countries represent markets where Bitcoin has been made completely illegal and criminalized. Lastly, some countries have yet to comment on Bitcoin’s legality, which are represented by gray color. As the visual shows, Eastern countries appear a lot more closed off to Bitcoin than their Western counterparts. Russia is currently the largest country to illegalize Bitcoin. However, China and South Korea are the latest two countries to step up their scrutiny and regulation of Bitcoin use. This has led to the recent sell off across the cryptocurrency market, as China and South Korea are two vital hotspots that have historically contributed a lot of trading liquidity to the emerging market. However, South Korean citizens are not going down without a fight. A recent petition to stop the cryptocurrency ban and fire government officials has exceeded 100,000 signatures. North American and Western Europe are the most accepting regions for Bitcoin. The Middle East appears to be very divided on the topic of Bitcoin. Interestingly enough, Iraq, Iran, and Turkey are legal Bitcoin markets, while Afghanistan, Pakistan, Saudi Arabia, and Egypt have varying degrees of restrictions on the cryptocurrency. There are currently 99 (40%) countries that have unrestricted Bitcoin laws, out of 246 total. Nearly seventeen countries, or 7% of the world, has either restricted or illegalized Bitcoin. Interestingly enough, 53% of the world has yet to comment on Bitcoin and the legality of its use within their countries. This is a risk for Bitcoin, as some of these undecided countries could eventually decide to place restrictions on cryptocurrencies. Overall, a majority of the world still has yet to comment on the legality of Bitcoin. The emerging industry is still not fully understood by global regulators, which may explain why some countries have yet to comment on the movement. As time passes, countries that have remained on the sideline will eventually come out with a set of regulations that either approve Bitcoin’s use or illegalize the activity. Bitcoin’s rise in popularity continues to exceed expectations, but not all countries will see cryptocurrency in a favorable light.